WE MADE IT!!!! We were really tired after 12 days on the river - ready for a shower, clean clothes and our own beds. 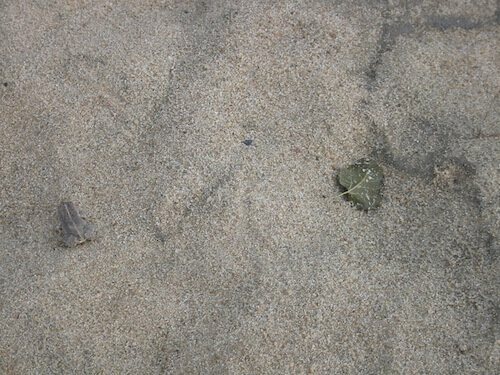 However we were very satisfied that we had done a good job documenting the Kaw in low water. We will be able to compare our photos and notes to last years Inventory data for any changes. One activity we added on this trip was to do field water testing on samples collected below waste water treatment outfalls and other obvious outfalls. We got some interesting results and will share them with you after we do some follow up investigation. 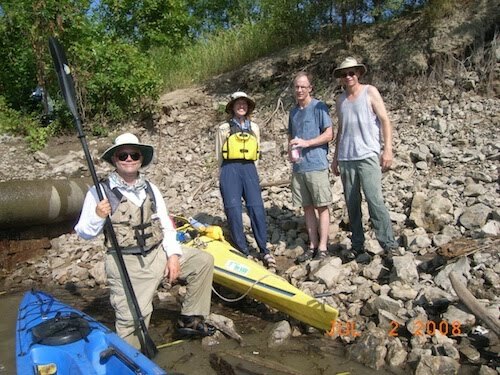 As Kansas Riverkeeper, I would like to personally thank both Dr. Cynthia Annett, Friends of the Kaw's Scientific Advisor, and RJ Stephenson, Friends of the Kaw's Board Member and official Inventory Photographer. I could not have done this trip successfully without their assistance. Laura, RJ and Cynthia at the end of the float. Our official Kaw River Inventory photographer, RJ Stephenson. We left our cozy little campsite at about 9:00 - just packing our kayaks made us so hot we had to soak in the river for a few minutes before we started our paddle. 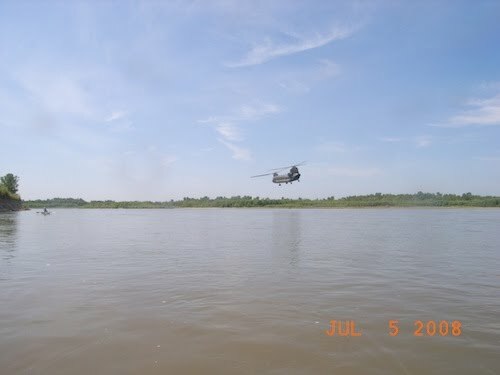 Later that morning as we were rounding a bend we heard a loud engine and were buzzed by an Army helicopter flying really low over the Kaw. As the temperature was predicted to rise to over 100 degrees we took a long lunch stop that included a rest in the shade. We soaked again before we got back on the river. We decided to continue on after De Soto so our next day to Edwardsville would be a short one. We found another shady camp site and settled in for the evening - we paddled 18 miles. We had more yummy corn for dinner. Late in the night thunderstorms passed us by on both sides - we did get some wind and rain but survived. RJ and Cynthia fix breakfast - RJ's Jet Boil boils water in about 45 seconds. Inventory camp on a sand bar. After another warm night we packed our kayaks and left for Lawrence. We paddled past the Lawrence Energy Center and arrived at the North River Front ramp about 11:30am. 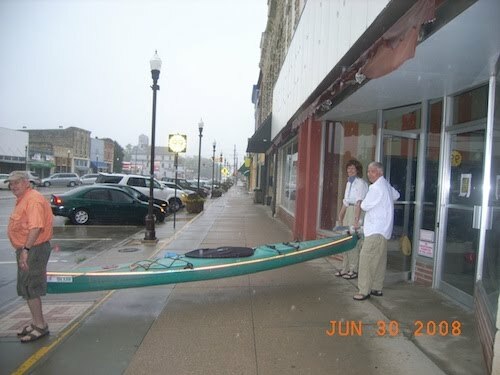 We decided not to portage Bowersock Dam because of the heat so we took our kayaks by pick-up truck to the Oak Street Ramp. Our thanks to Ray Peirotti and Karen Stephenson for helping us transport our boats and supplies. We had a delightful lunch at Johnny's Tavern in north Lawrence and then headed to our "office" at La Prima Tazza to log on to the wi-fi and work on this blog. A big thank you to Heidi Mehl for letting us use her laptop computer to up date the Inventory Blog and back up photos from the GPS camera. We left from Oak Street ramp in Lawrence about 4:00 and paddled about 5 miles to a SHADED sandbar just after Mud Creek to camp. 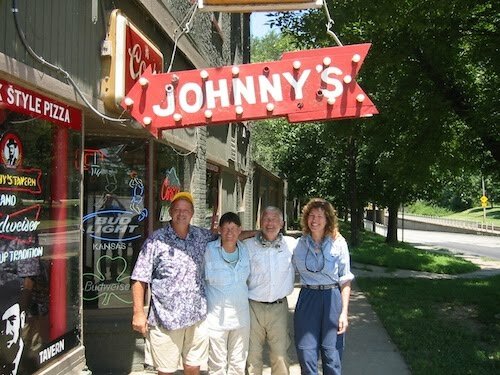 Rick Renfro from Johnny's gave us several fresh ears of corn wrapped in foil. We cooked them in the coals of our campfire and they were delicious. R.J. made us seasoned potatoes which we also cooked in the coals. We had a really special dinner that evening. Cynthia goes by Lawrence Energy Center. Rick Renfro, Laura, RJ and Cynthia after our great complimentary lunch. 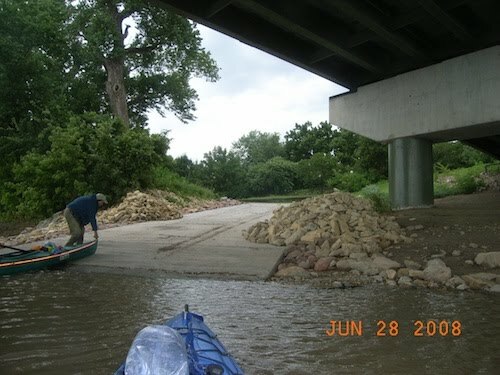 We left our camp site just past the Highway 4 bridge and paddled to the Lecompton Ramp. 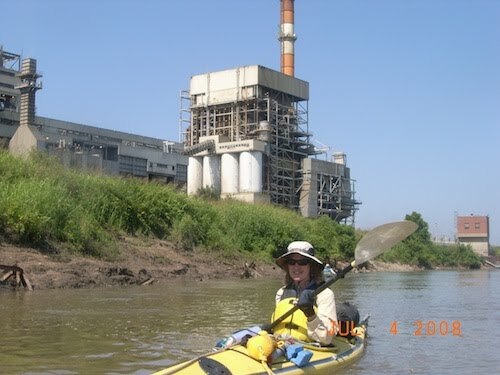 A beautiful section of the river but we do pass the Tecumseh Power Plant just east of Topeka. It was a hot day so we stopped in the shade of some willow trees to eat lunch and take a rest. We were awakened from our siesta by voices from a group of canoes and kayaks coming down the river. They stopped just beyond our spot for a swim and had gotten their canoes and kayaks from the new outfitter in Lawrence "Up a Creek". We arrived at the "Rising Sun" Access Ramp north west of the Lecompton Bridge about 4:30pm and were interviewed by the Lawrence Journal World. We also met Heidi, Nasbah, and Temashio for Ray Pierotti's (Cynthia's husband) birthday celebration. 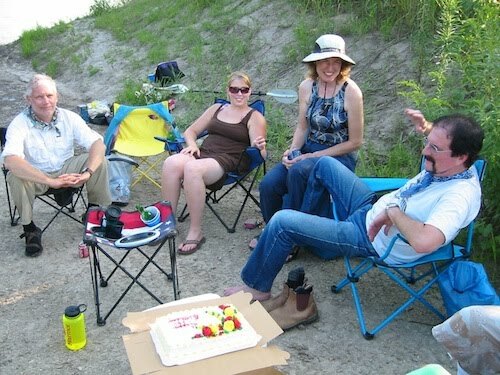 We had cold drinks, sandwiches and cake and ice cream (all luxuries to the research team.) 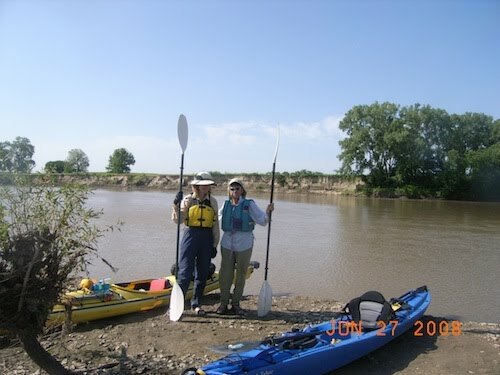 We then paddled off to camp on a sand bar about a mile below the Lecompton Bridge. 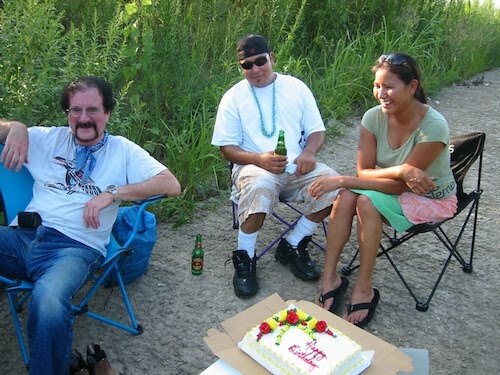 Ray's BD party at the Lecompton Ramp - from left to right are RJ, Heidi, Cynthia and the birthday boy. Heidi Mehl is our newest Friends of the Kaw Board Member and brought a cooler full or cold drinks. Laura (with umbrella) and Cynthia paddle in the heat of the day. We got an early start (no oatmeal!) so that we could make it to the Oakland treatment plant for lunch. This was a challenging stretch of the river-- many thanks to our good friends Craig Thompson and Steve Cringan, who were waiting on the bank above the water weir and signaled us to shore (its not always easy to see where the drop is). Craig and Steve were wonderfully helpful during the portage down the slippery bank around the weir. 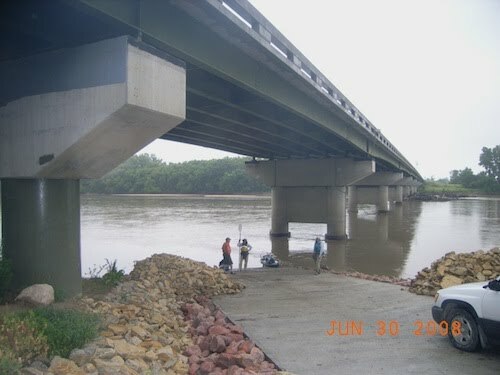 Our next "challenge" was the causeway under the new Topeka Blvd bridge. Causeway may be too polite a term-- most of the way across the channel it is a dirt road, but the river flows through a concrete grating on the south bank. 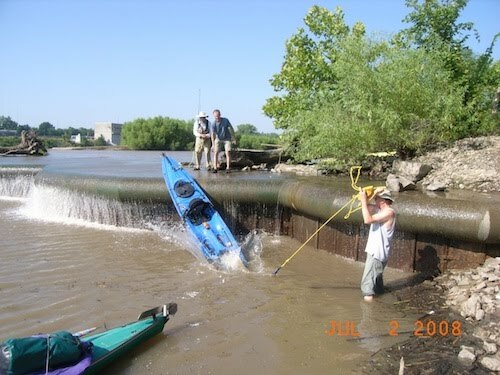 After a little scouting we found a safe place to drag the kayaks up and over the dirt dam and continued our tour of Topeka's waterfront. Lunch at the Oakland wastewater plant was a big treat-- fresh salads and popsicles! Many thanks to Bob Sample and Kelly Haller for hosting us. At the moment R.J. and Cynthia are using a borrowed computer to do our blog entries while charging the camera batteries. Laura is sitting in on a staff meeting and probably is the only person to arrive to work in a kayak. We are looking forward to getting the bags we left here at the plant with fresh food, drinking water, and changes of clothes. This afternoon we will continue through Topeka and camp somewhere past Seward. Our next computer and battery stop will be in Lawrence, and Laura will update our blog when we arrive (after pizza at Johnny's). R.J., Craig & Steve "portage" R.J.'s kayak over the Topeka weir. R.J., Cynthia, Craig and Steve after the portage. 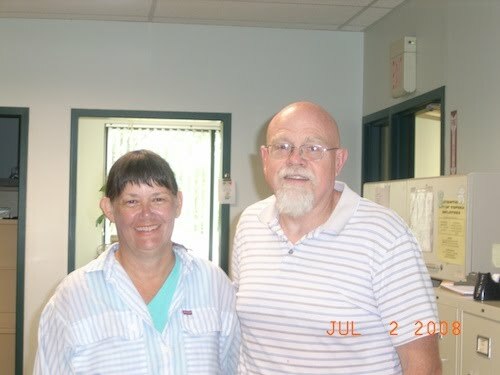 Laura and Bob Sample, general manager of Oakland Wastewater Plant in Topeka. We arose to a very foggy, damp morning and after our typical breakfast of oatmeal we packed our damp gear and pushed off. Our "heat stroke float" seemed more like a "fogged in float", but we're not complaining. This was the last day before the river became "urban" and we enjoyed the beautiful scenery as much as possible. After the rains from hurricane Dolly passed through we had cool, overcast, perfect kayaking weather. Many thanks to Craig and Karen Graves, our hosts in Manhattan, Bob Cole, our host in Wamego, and Ed and Sheree Pugh, who provided us storage space in Wamego for the kayaks. Mike Calwell transported us back to Wamego for the continuation of our journey. We paddled 24 miles and stopped several miles above the Maple Hill Bridge to camp. Mike Calwell helps us get our kayaks and gear out of storage in Wamego. Mike is also a Friends of the Kaw board member and was instrumental in the success of this trip. Many thanks to his behind the scenes efforts - shuttling, picture taking, lending Cynthia his kayak and much more. Launching at the new Wamego access ramp just under the Highway 99 bridge. Cynthia and Laura on a sand bar. Our team is holed up along the river in a dry place with our boats and gear under cover in Wamego, thanks to friends with extra space in downtown. Wamego is populated with friendly people and busy main street. RJ found an upscale coffee and chocolate shop where he purchased a pound of Guatemalan beans for his wife. (He hopes that she will enjoy it so much she'll prepare his favorite Hawaiian meatballs and rice dish for him when he gets home.) We're using the time to analyze samples, review data we've collected and search for pens that write in the rain on wet paper. Fortunately we found a Space Pen and it will do that and more! Looks like thunder boomers, lightning and rain tonight, but tomorrow we can launch in light rains with some assurance the sun will be shining by late afternoon when we find a nice sandbar to camp on. We met up with Mike Calwell in Manhattan. Laura convinced us to try a Jamaican restaurant she had discovered on a previous trip. It was great and we had a wonderful dinner. The Good News -We made it to Wamego!!!! The morning was eventful with thunderstorms all around us - lots of wind and some rain. The night before we stopped to camp half way between St. George and Wamego so we only had 5.5 miles to paddle to Wamego restock, recharge batteries and have a home cooked lunch at the Friendly Cooker. Bob Cole with Pottawatomie Eco Divo was our host. The Bad News - The skies turned black above us, instead of all around us, and the rains came down, despite the weather predictions of 102 degree temps. Science and photography became difficult to impossible. And, since they are the emphasis of the trip, downriver progress has been put on hold until Wednesday, when it looks like we may be blessed again with clear skies. We land at the new Wamego access ramp midday in the rain. 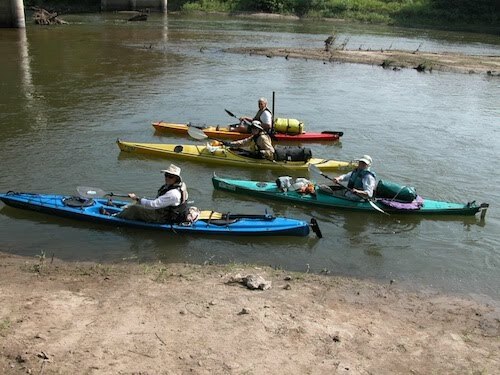 The Friends of the Kaw are kayaking the entire 170 miles of the Kansas River in an effort to digitally map it. 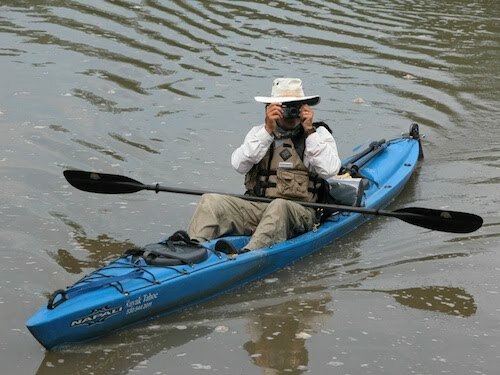 The kayaker's are outfitted with a camera that has a g-p-s so that they can accurately document the river. The friends of the Kaw have been compiling this information for 3 years. This data will help identify problem areas along the river that need restoration. The Friends of the Kaw Kansas River Keeper Laura Calwell said, "This morning we have seen a couple areas where people are dumping. There are some old dump sites with old cars and tires. We will be taking water samples and testing them around waste water treatment plants and other discharge points along the river." 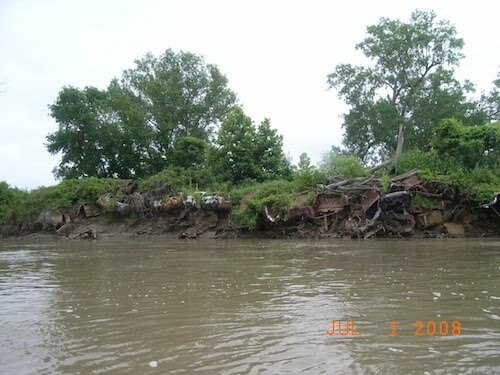 The Friends of the Kaw have a pollution hotline for people who witness illegal dumping on the river. If you see polluting you can call 866-RIV-KEEP. Chip paddling in the shade of his umbrella. Unfortunately Chip had to leave the research team after we landed in Wamego to tend to business at home. We thank him for his help on the first part of the inventory trip. 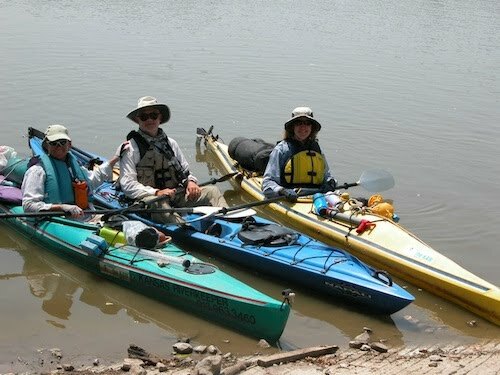 The research team - Laura Calwell, Kansas Riverkeeper; Dr. Cynthia Annett, Friends of the Kaw Scientific Advisor, R. J. Stephenson and Chip Farley pushed off from Junction City at 10:15am. Mike Calwell assisted the team with the shuttle of boats and equipment. We collected water samples above and below Ft. Riley's and Ogden's waste water treatment plant discharges and also above and below Clarks Creek. We traveled 15 miles under sunny, hot conditions and did battle a slight headwind. 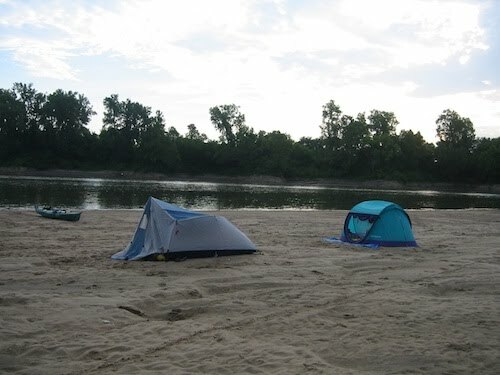 We camped on a beautiful sand bar at rivermile158, fixed dinner and enjoyed a delightful campfire before retiring to our tents. RJ, Laura, Cynthia and Chip leaving from Junction City. 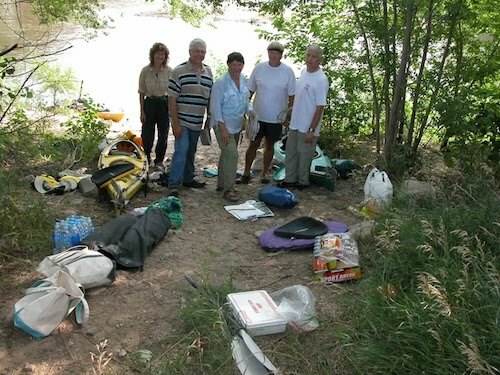 Cynthia, Jim Steichen, Laura, Chip and RJ loading gear in kayaks before departure. Jim is a Friends of the Kaw Board Member from Manhattan and we thank him for shuttling Laura's car and helping us get off. 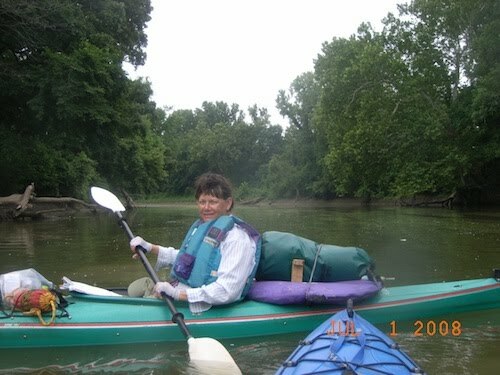 This Saturday, July 26th, Laura Calwell, the Kansas RiverKeeper, will lead the second survey of the entire Kaw with several intrepid volunteers. We are collecting data on physical structures, areas in need of monitoring/restoring, and doing some water testing above and below some industrial and wastewater discharge points to the river. As you might remember, we officially started this project a year ago last spring and this year we are hoping to catch the Kaw at a lower water level. 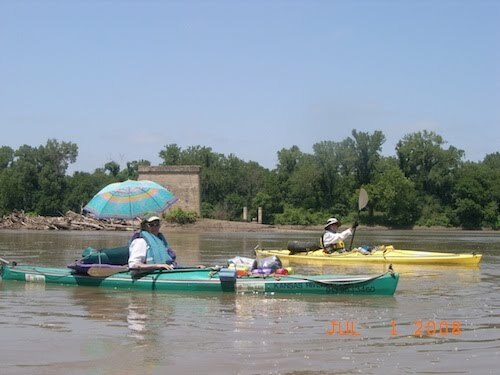 This float is a great opportunity for Laura to physically patrol the Kaw and report to appropriate agencies any questionable river practices we document and observe. We have also applied for another grant to help us develop a database for the photos and information collected on both last year's and this year's inventory floats. We will be publishing the information on this website for the public to access and use-- for example, one might check out pictures we post for certain river miles on a stretch that they are planning on floating, or check on the permit status for an outfall near their homes. 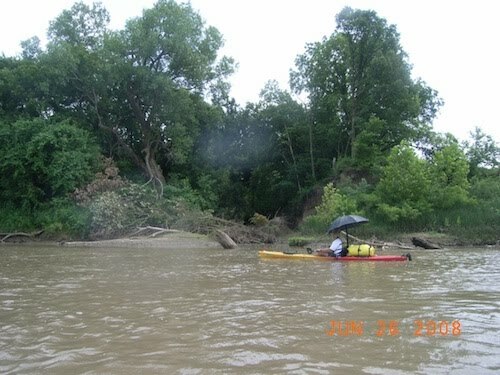 We plan to be on the river for 13 days and will post our progress every few days on this blog page. Please join us for a "virtual" adventure as we make our way down the river from Junction City to Kansas City.